Quanser is a provider of educational teaching and research tools for controls, robotic and mechatronics. So when the Mechanical and Mechatronics Engineering Department of the University of Waterloo, considered by many to be Canada’s top engineering school, invited us to be a part of their annual Mechatronics Symposium, we accepted with alacrity. The Mechatronics Symposium is an end-of-year capstone project showcase for Waterloo’s fourth year engineering students. The challenge for the students is to work in teams to design and build prototypes of commercially viable products that promise to improve the quality of life in big and small ways. Once again Waterloo’s senior engineering students more than met that challenge. This year, Quanser was represented by Paul Gilbert, Quanser’s CEO and Dr. Tom Lee, Quanser’s Chief Education Officer and a University of Waterloo graduate. Their first duty was to be part of the larger panel of judges of the Symposium, but they also spent a good deal of time mingling and talking to students and faculty alike. 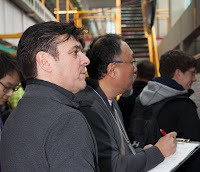 Paul Gilbert, Quanser CEO, and Dr. Tom Lee, Quanser Chief Education Officer, were part of the judging panel that collectively assessed over 150 capstone projects from fourth year engineering students at the University of Waterloo's 2013 Mechatronics Symposium. Both Paul and Tom found the quality of the presentations first-rate. “I loved talking to the students,” Paul says. “Across the board they’re incredibly bright and completely focused on problem solving, and that’s typical of Waterloo-trained engineers.” Proof that that’s not mere flattery: upwards of 50% of Quanser engineers are Waterloo graduates and half of the company’s management team are Waterloo grads as well. Over 150 diverse projects were presented over the course of the day. They ranged from a single player air-hockey table and an automated egg washer for small scale farms, to a portable water purification system that can be attached to a bicycle and a search-and-rescue robot that replaces a rescue worker. Quanser was pleased to sponsor a $500 prize for Best Presentation, which went to the team known as Group 11. Their project was an automated Laparoscopic Suturing Tool that could assist in abdominal surgery. It was designed in collaboration with KidsArm Project researchers at the Hospital for Sick Children in Toronto, Ontario. 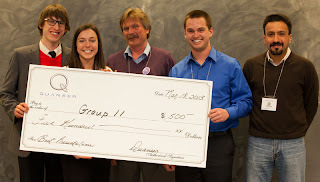 The award for Best Presentation, sponsored by Quanser, went to Group 11 for their Automated Laparoscopic Suturing Tool. Shown above: Karl Price, Angelica Ruszkowski (Group 11); Professor Jan Huissoon, Chair of the Department of Mechanical and Mechatronics Engineering, University of Waterloo; Brock Kopp (Group 11); Professor Willaim Melek, Director of Mechatronics Engineering, University of Waterloo. Can Engineering Theory Ever Be Fun?